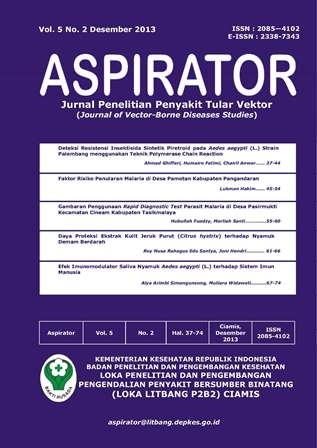 ASPIRATOR - Journal of Vector-borne Disease Studies ASPIRATOR - Journal of Vector-borne Diseases Studies is an open access, peer-reviewed, online journal fully dedicated to publishing quality manuscripts on all aspects of tropical vector-borne diseases, i.e malaria, dengue, lymphatic filariasis, chikungunya, schistosomiasis, leptospirosis. 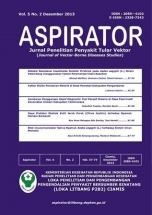 Ministry of Health Republic of Indonesia publish ASPIRATOR - Journal of Vector-borne Diseases Studies since 2009. Published twice in a year (June and December). Aspirator has already been indexed by Directory of Open Access Journals; Indonesian Scientific Journal Database; Indonesian Publication Index; Bielefeld Academic Search Engine. See Google Scholar Profile for Aspirator Journal by clicking here.